Born in 1970 in Kyoto and living in Kyoto Japan. Graduated from Kansai Gaidai University. When I was an exchange student in Washington State, U.S. my host father was an amateur geologist and I was deeply influenced by him. When I visited Yosemite National Park several years later I saw an U-shaped valley carved by glacier and then I decided to study geology. Today I am an external researcher at Osaka Museum of Natural History and a science writer. 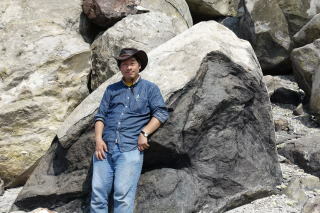 Since when I first time visited the Shiretokoiozan volcano in the summer of 2005 I have studied it for around 15 years. This year I will implement electromagnetic survey and study sulfur specimens. I will study sulfur eruptions of Jovian satellite Io in the future. ・Yamamoto, M., Goto, T., and Kiji, M., Possible mechanism of molten sulfur eruption: Implications from near-surface struc- tures around of a crater on a flank of Mt. Shiretokoiozan, Hokkaido, Japan, J. Volcanol. Geotherm. Res., 346, 212-222, 2017.